Adding this race to our calendar was a last minute decision. I have been wanting to do a fall half marathon before our planned Wine and Dine honeymoon trip. With so many trips planned for this fall, it was hard to find a half that fit our schedule. We also didn't want to travel to a race, since we'll be doing so much traveling already. 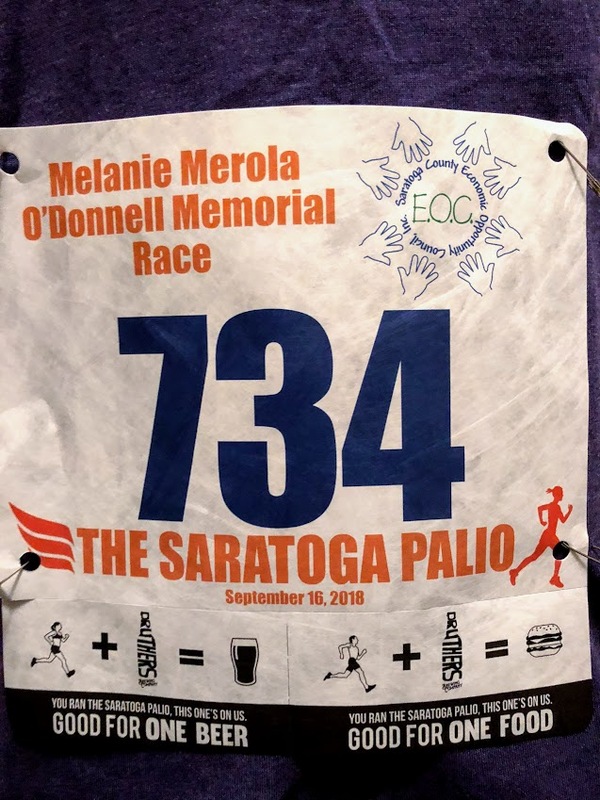 While in Saratoga last weekend, Nicole and I saw a sign for this race and figured since it's local, to check if there were still spots open. Lucky us! We were able to register on the Tuesday before the race. When you come from the world of runDisney, where you have to register months in advance, sometimes it's nice to just pick up a bonus race. 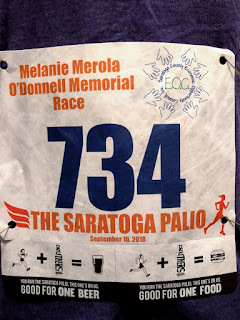 We took a trip to Saratoga Springs on Saturday afternoon to pick up our race bibs. That way, it would be one less thing for us to worry about on race morning. Packet pick-up was held at the Saratoga Springs Hampton Inn. This was truly a packet pick-up and not an expo. However, it was organized and efficient. Nicole and I were quickly able to get our bibs and our long sleeved tee shirts. In my world, a long sleeved tee is the holy grail of race shirts. They tend to fit the best and are always super comfy. I even liked the orange color of this one! 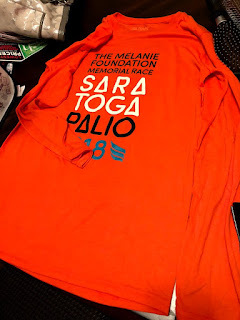 After wearing it, I can confirm this is my new favorite race shirt. By 9:00PM, we were in bed, hoping for a good night's sleep before our early alarm the next morning. (Not as early as a runDisney race, but still!). Unfortunately, neither one of us slept well. At 5:20AM, my alarm buzzed and I was up. I started the coffee maker and took Archie for a walk. Nicole was up not too long after me. We were both glad we had set out our clothes the night before, making getting ready a breeze. After making sure we had everything, we hit the road around 6:15AM. 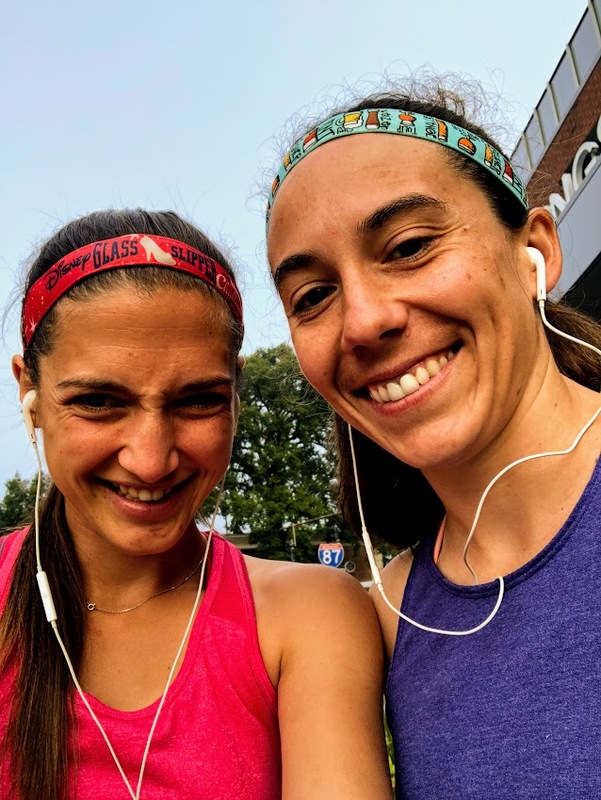 On the way to the race, we listed to the newest Joyful Miles podcast for a little bit of runDisney inspiration! We arrived in Saratoga Springs around 6:45AM and looked for parking, settling on our usual parking deck. It was great to be able to easily find parking, something I always worry about on race day. Since we were a little early, we hung out in the car for awhile, eating our pre-race breakfasts: cereal for me and a granola bar & banana for Nicole. Around 7:10AM, we headed to the start line at the Saratoga Springs City Center. Before I knew it, it was time to line up. While there were no corrals, as this race was small, people did a great job of seeding themselves appropriately. In fact, the race director kept encouraging us to move closer to the start line. Just before 7:45AM (the official start time) was the singing of the national anthem...and then we waited. They had to clear the course of traffic, so the race was a little delayed. The race started at 7:50AM. Once we started running, I felt good. I can usually tell within the first mile how a race is going to go. 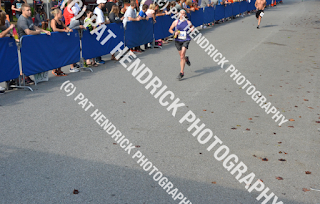 I've definitely had races where my body just didn't want to cooperate...and that makes for a miserable 13.1 miles. Luckily, that was not the case with this half marathon. Running without a watch, I had to run by feel, which I find myself preferring these days. I hit the first mile marker at 6:32. A little fast, but I was feeling good and decided to trust myself and check in again at 5K, where the next clock would be set up. I hit 5K at 20:51 and was still feeling good. I decided to keep the pace as best as I could. I also loved running through Saratoga Springs State Park. It was so pretty! The shade provided by all the trees was also extremely appreciated. I'll need to take a trip here when the leaves start to change, I bet it's beautiful. 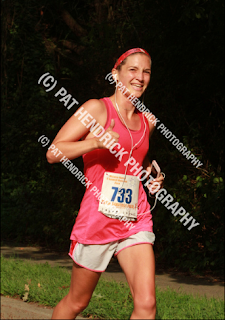 The stretch from 5K to 10K was probably the most difficult part of the race for me. In fact, once I get to mile 6, I find that I'm locked into a pace and can finish strong. But, getting to that place? That's sometimes rough. I hit the 10K mark at 42 minutes and change. Obviously, this means I slowed down a little bit. I was also wishing I hadn't left my Honey Stinger gummies in the car. Whoops! 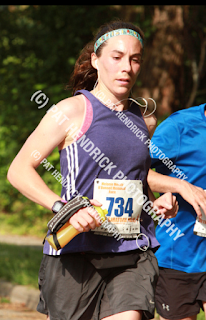 It was around this point, that I decided to just run the race for fun. 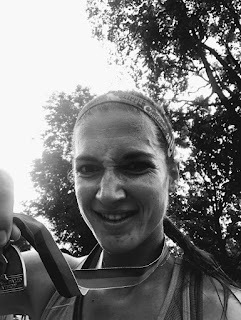 It became clear I wasn't going to get an overall place, especially when the girl in front of me had a bib-less pacer and two bikes with her. I mean, seriously? It made it hard to even try to pass her when they were taking up a good chunk of the path. I could feel myself getting annoyed. I reminded myself that this is supposed to be fun and to not take it so seriously. By focusing on this, I was able to change my mindset for the rest of the race. I passed the 15K mark in 1:04. This was five minutes faster than I ran the Stockade-athon last year. I couldn't believe it! Maybe there was something to this whole running by feel thing. 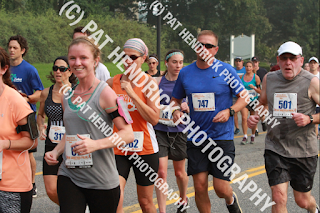 At this point, I was telling myself to just hang on to the pace as best I could, and see what was left in the tank around mile 11. After passing the mile 11 marker, I decided to push the pace a little bit and see what I had left. Looking back, it was a little too early to do this, but I had to at least try! 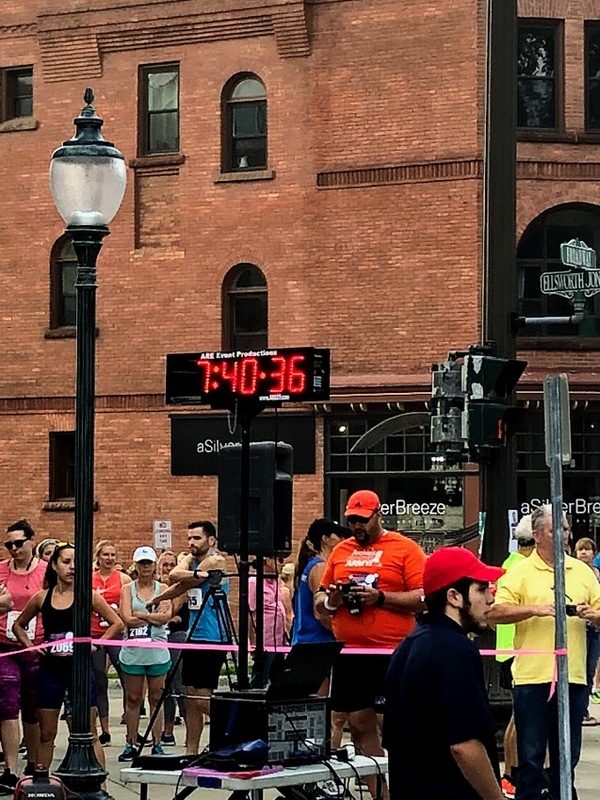 One great thing to mention about this race: even though the race didn't have clocks at each mile, many of the mile markers had a person with a watch calling out the times. 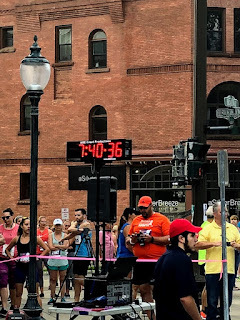 When I hit mile 12 and he called out 1 hour 24 minutes, I couldn't believe it! Maybe I had heard him wrong. Was I really on pace for a PR? My standing PR, which I set last year was 1:34:56. Even if I ran basically a 10 minute last mile, I'd get a PR. Convinced I heard the man wrong, I nevertheless picked up my pace. One great thing about the course is that you finish on a downhill. 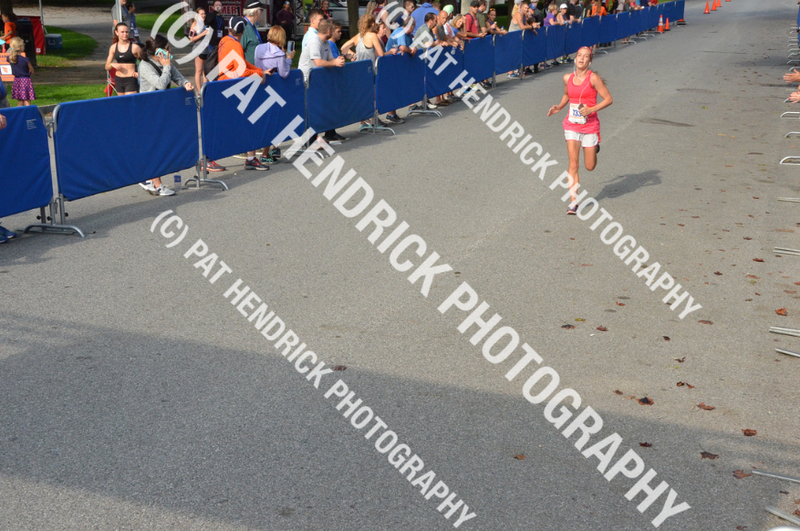 You crest a small uphill and then fly into the finish line at Congress Park in downtown Saratoga Springs. It's great to have the crowd support at the finish. We even had our friends Lauren and Colin come and cheer for us. It was great to see familiar faces at the finish line! I couldn't believe the clock when I looked up. I finished with a HUGE PR of 1:32:02. That's more than 2 minutes faster than my previous PR. I'm still not quite sure how that happened. 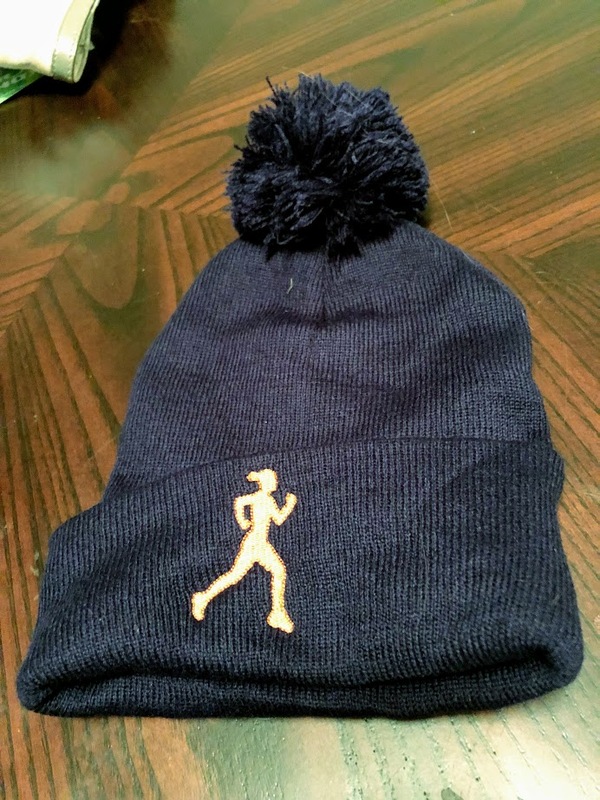 I think it was probably a combination of a multitude of factors: low race temps, a great course, a positive attitude, my expanded strength training, and honestly, running without my watch. I never thought I'd be able to "run by feel" but it's working for me. When I wear my watch, I tend to obsess about the time and subconsciously pump the brakes if it looks like I'm going too fast, regardless of how I'm feeling. I am so proud of this PR. It's going to be a great runDisney proof of time! After getting my medal and grabbing a banana and a Gatorade, I met up with Lauren and Colin to wait for Nicole. Before the race, Nicole told me she was "just going to shuffle." I know my wife. While that may be her plan, she's a naturally competitive person, and I knew that if she was feeling good, she might run this thing harder than she planned. That's exactly what happened. Before I knew it, Colin spotted her. "Here comes Nicole!" he said. Soon we were all cheering! I looked at the clock and new Nicole had hit a PR as well. It was a great race for both of us! After cheering for some other finishers, we say goodbye to our friends and went to check the results. I ended up coming in first in my age group, so we stuck around for the awards. Since Druthers, a local brewery was a race sponsor, we each got a free beer with our race bibs. Guys, I try really hard to like beer, but I just don't. Luckily we found a nice guy who was more than happy to take a second free beer. A few minutes later, I accepted my award which was a lanyard and a winter running hat...nice! 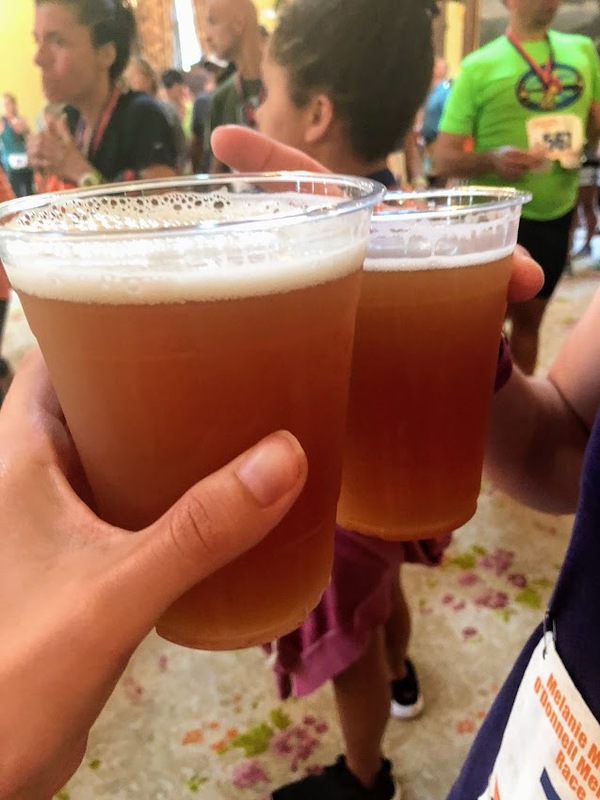 Since it was nice out and Nicole had to finish her beer before we left the park, we headed back to the finish area to cheer on the final finishers. I've said it before and I'll say it again, the true magic of a race is in the back of the pack. It always makes me so sad when there's no one left to cheer for the final finishers. I try and stay to cheer on those guys as often as I can. I highly recommend it. You'll always have a smile on your face and maybe a little tear in your eye. 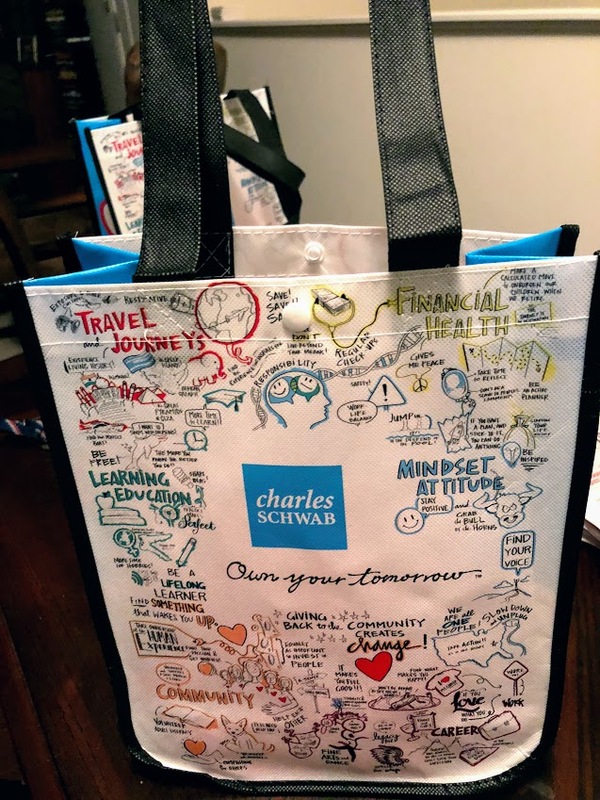 I love when age group prizes are practical and useful! Overall, the whole race experience was outstanding from start to finish. I loved everything from how organized packet pick-up was, to the great course, to the small size of the race. 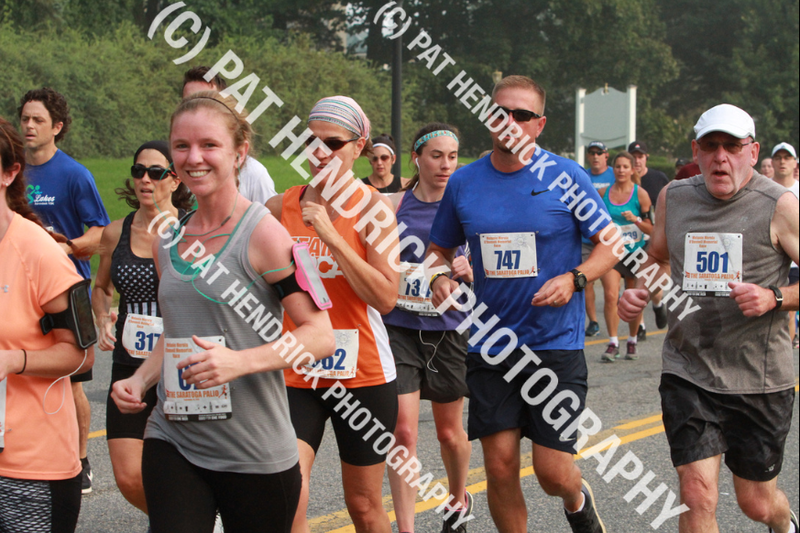 If you're looking for a fall race for your calendar, I cannot recommend this one enough!